Described as “country kitchen,” Janie’s boasts a homey, casual atmosphere with friendly waitresses and good food. Open for breakfast and lunch, breakfasts range from omelets to breakfast sandwiches. Omelets choices include Cheese, Mediterranean, the Hog Wild, and South Western. “Scramblers” include choices like Bacon and Cheese, Meat Lovers, and Italian. The Cafe’s breakfast menu also includes specialty choices like a Cinnamon Loaf French Toast, Eggs in a Basket, and Steak and Eggs. For those watching the waistline, lighter options are Veggie Benedict, Veggie Omelet, and the One by One Lite Breakfast. Breakfast combos are also available for those who want a little of everything. A variety of eggs Benedict meals are available, like the Florentine Bennie, the Crab Cake Bennie, and the Irish Bennie. Traditional breakfast sandwiches like egg and cheese and bacon and cheese are also available. The Lunch Menu offers sandwiches, rollups, burgers, melts, soups and salads. Sandwich choices include the Stueben, The Rachel, and a classic BLT. Rollups include the Ultimate Veggie, the Steak Tip and the Chicken Teriyaki. Burgers offered are the BBQ Burger, the Ultimate Burger, and the Bacon Burger. Janie’s Melts are pressed in the hot panini grill, and range in flavors like Chicken Caprese, The Bella, and The Italian. Salads range from the basic garden and casears to the BBQ or Buffalo Chicken Salads. Soups include a hearty chili, and a soup and chowder of the day. Breakfast choices range anywhere from three to nine dollars. Lunch options can be ordered for only six to nine dollars. Janie’s Uncommon Cafe is open Monday through Saturday from 6 AM until 2 PM. The cafe is also open Sundays from 7 AM until 2 PM. 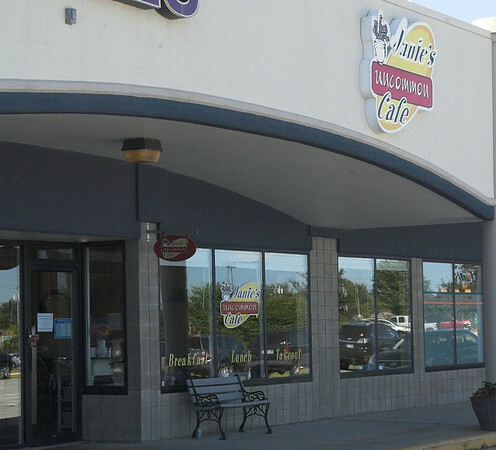 Visit Janie’s Uncommon Cafe online, or eat in their location at 123 Nashua Road.